Summary: this posts looks at the Oath Keepers. Potentially valuable (perhaps even critical support). Potentially dangerous (perhaps disastrous). Their goal is commendable; their actions sometimes worrisome. At worst they could become a nucleus for fourth generation war in the US. It’s too soon to tell how they will evolve. (1) Who are the Oath Keepers? 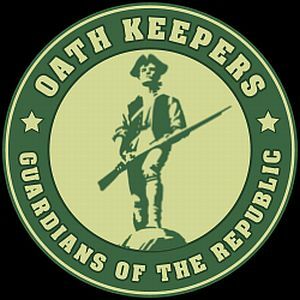 Oath Keepers is a non-partisan association of currently serving military, reserves, National Guard, veterans, Peace Officers, and Fire Fighters who will fulfill the Oath we swore, with the support of like minded citizens who take an Oath to stand with us, to support and defend the Constitution against all enemies, foreign and domestic, so help us God. Our Oath is to the Constitution. Our motto is “Not on our watch!” Read complete description here. Do the leaders and members of the Oath Keepers have the self-discipline to keep the organization focused on the oath and related issues? Or will it get hijacked by those with broader political aims, becoming a group of uniformed and armed partisans? They will stand up to President Obama. Will they stand up to rogue Oath Keepers? Or will they turn a blind eye to them. Rot starts in a basket with a single apple. Are these people we should trust, outside of the official organizations which regulate them? What fraction of the Keepers are people we should fear, hoping their uniformed superiors keep them on a tight rein? What is their stance on today’s Constitutional issues, such as torture, excessive violence by SWAT teams, and illegal seizures of person and property? How many follow Rhodes in these matters? For a balanced view of these questions see “Oath Keepers and the Age of Treason“, Justine Sharrock, Mother Jones, March/April 2010 — “Glenn Beck loves them. Tea Partiers court them. Congressmen listen to them. Meet the fast-growing “patriot” group that’s recruiting soldiers to resist the Obama administration.” Impressive work, especially since Mother Jones is a often a leftist rag. Excerpts follow. is kill the American Dream. At lunch, when I questioned my tablemates about the Obama-Hitler comparisons I’d heard at the conference, I got a step-by-step tutorial on how the president’s socialized medicine agenda would beget a Nazi-style regime. I learned that bringing guns to Tea Party protests was a reminder of our constitutional rights, was introduced to the notion that the founding fathers modeled their governing documents on the Bible, and debated whether being Muslim meant an inability to believe in and abide by — and thus be protected by — the Constitution. I was schooled on the treachery of the Federal Reserve and why America needs a gold standard, and at dinner one night, Nighta Davis, national organizer for the National 912 Project, explained how abortion-rights advocates are part of a eugenics program targeting Christians. … Mack runs the “No Sheriff Left Behind” campaign encouraging state and local authorities to disregard federal laws that they believe violate states’ rights. During the 1990s, he successfully eviscerated a Brady Law provision requiring sheriffs to run background checks on handgun purchasers. Another sheriff who spoke, Mark Gower of Iron County, Utah, uses Mack’s precedent to refuse to act against property owners who violate the Endangered Species Act. The conference’s lifetime achievement award went to Army Specialist Michael New, discharged in 1996 for refusing to wear a United Nations helmet and patch while serving in Germany. … IN VEGAS, Rhodes took me aside repeatedly to explain that many of those in attendance — including featured speakers like “Patriot Pastor” Garrett Lear (“When a government doesn’t obey God, we must reform it”) — might not represent Oath Keepers’ official message. He and his Web staff have been overwhelmed, he told me, by the amount of policing required to keep people from posting “off message” commentary encouraging violence or racism. Shortly after I asked Rhodes about Dyer — before his arrest hit the news—his testimonial vanished from the group’s website­. Rhodes once endorsed Dyer in glowing terms, but now claims he was never a member because he hasn’t paid dues. Yet Dyer publicly referred to himself as an Oath Keeper, and Rhodes had previously insisted — to Lou Dobbs and anyone else who would listen — that you didn’t need to pay dues to be a member. (b) The infamous Homeland Security Department assessment report “Rightwing Extremism: Current Economic and Political Climate Fueling Resurgence in Radicalization and Recruitment“, 7 April 2009. Often cited by right and left, pro and con. Does not mention the Oath Keepers. The Police Officers, National Guardsmen and military officers who have contributed to this special publication are aware of a plan to overthrow the Constitutional Republic of these United States of America. This publication, many months in preparation, was found difficult to compile for many reasons. One important reason was that none of the officers involved were pleased with the duty of bringing to the attention of our colleagues the names and activities of some in our nation who have been in the past (or presently) engaged in what can only be described by law as treason and/or sedition against their own government. While detailing the plan of these Internationalists, the main goal of this special police publication will be to promote an active program that will defend America from those at work forming an oligarchy of Imperialism against this nation of free people. The herein-described plan to halt this un-American activity can succeed only with the combined efforts of the People’s Protectors (the Police, Guardsmen and Military) and their countrymen in the private sector. “The Second Wave – Return of the Militias“, Southern Poverty Law Center, August 2009 — Given the history of Amerian para-military organizations oppressing Blacks, their concern is understandable. Throughly researched; discusses O.K. on page 7.